WASHINGTON, April 20, 2015 - Military training exercises begin today in Ukraine for Fearless Guardian, and in the Philippines for the 31st iteration of Exercise Balikatan, a Pentagon spokesman said today. "This latest training, which is as valuable in peacetime as it is in times of conflict, is to establish a professional force that protects and defends Ukraine's people [and] the country's sovereignty," Warren said. "The Defense Department will continue to work closely with Ukraine to provide assistance, training and advising support," Warren said, "including through our U.S.-Ukraine Joint Commission on Defense Cooperation, to Ukraine, over the long term." On Feb. 2, Canada's Defense Minister Rob Nicholson announced that Canada would join the commission "to better coordinate Canada's ongoing provision of assistance to the Ukrainian Armed Forces." "Thus far, we have provided the Ukrainians with nonlethal aid only," he said, adding that the department delivered 30 Humvees to Kiev in March and will deliver another 300 in the coming months. The DoD is monitoring events in Ukraine, Warren said, "particularly in Eastern Ukraine where we know Russian forces are contributing to the destabilization and unrest." "It is a signature element of our alliance," Warren said. "This training proved invaluable during the relief mission [of November 2013] in the wake of super typhoon Haiyan," Warren said. The typhoon devastated more than 35 provinces in the Philippines and displaced nearly half a million residents. Note: In the above U.S. Marine Corps photo by Lance Cpl. 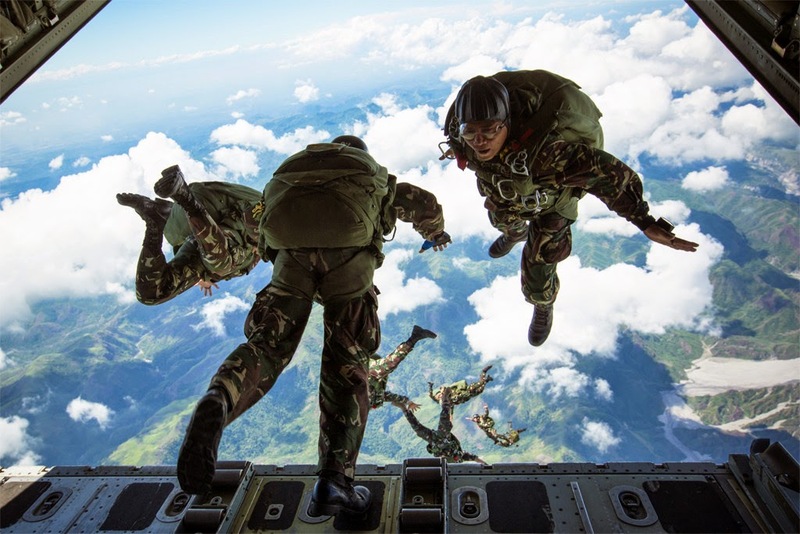 Allison DeVries, Philippine Army Special Forces freefall parachutists jump from a KC-130J "Sumos" aircraft over Crow Valley, Philippines, May 15, 2014, during high-altitude low-opening jump training at Balikatan 2014.